A relativistic jet simulation. Credit: G. Bodo and P. Rossi (INAF-Osservatorio Astrofisico di Torino, Italy) and A. Mignone (Torino University, Italy). Are blazars close-by and not far away? Twin lobes of gamma-rays extending beyond the Milky Way’s central bulge highlighted a previous Picture of the Day. The formations, each about 65,000 light-years in diameter, are a sign that Birkeland currents form z-pinches in galactic plasmas. Electromagnetic fields accelerate electrons to velocities that approach the speed of light, causing them to emit synchrotron radiation, the principle source for gamma-rays in space. Glowing Birkeland current filaments are the visible portion of an entire electric circuit threading through the Galaxy. The Milky Way shares characteristics with other galaxies: haloes of stars, infrared filaments, and radio-bright lobes, which point to electrical effects. Those Birkeland currents also manifest in other ways. Some celestial objects are so bright that they could be the most powerful energy sources in the Universe: quasars (QSOs), Gamma-ray Bursters (GRB), Fast Radio Bursters (FRB), and blitzars. The problem with those incredibly energetic phenomena is that they all reside at fantastic distances. They are so powerful and so far away that astrophysicists have no choice but to invent theories that involve neutron star collisions, supernova explosions, or black hole “birth pangs” to explain them. According to a recent press release, “…researchers from the Instituto de Astrofísica de Canarias (IAC) and the La Laguna University (ULL) has [sic] discovered a peculiar spiral jet with many twists.” Another active energy source is called a “blazar”. Blazars are also QSOs, active galaxy nuclei, but with plasma jets (electrons) perpendicular to what is believed to be an accretion disk surrounding a supermassive black hole. They appear more powerful and more variable than QSOs because their plasma jets are seen head on, while jets from QSOs are seen at an angle. How blazar electron jets achieve such high velocities is a mystery. 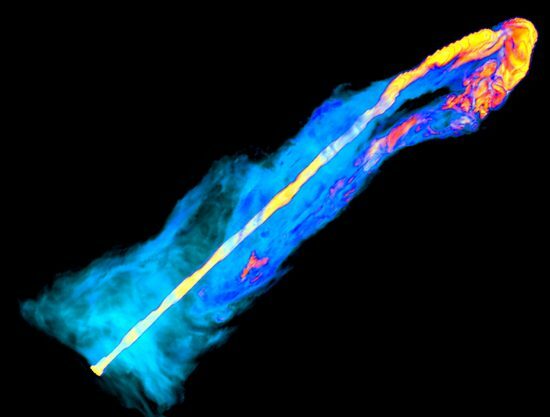 However, the “fire hose” jets are thought to “wind-up” the black hole’s magnetic field like a spring; so tightly that electrons “crash into” photons, causing gamma-ray emissions, while polarizing the radiation. In an Electric Universe it is not magnetic fields twisting around like corkscrews that accelerate electrons, it is electromagnetic fields. Birkeland currents, because they are electromagnetic, also possess electric fields. As pointed-out many times in the past, the easiest way to accelerate electrons is through an electric field. Electric charge flow in plasmas constricts the current channels. Those constricted channels are the jets, in general, seen by astronomers. Other electrical effects, notably a number of plasma instabilities and concentrations of energy at various points in the jet, along with a serpentine appearance, provide evidence that electricity in space should be given credence when there are unusual observations. The blazar observed by IAC astronomers is most likely a result of synchrotron radiation. If redshift is not a viable theory, as many previous articles discuss, then QSOs and blazars are not “billions of light-years” away, so they are not so powerful. If they are close by, in astronomical terms, then they should be re-evaluated.